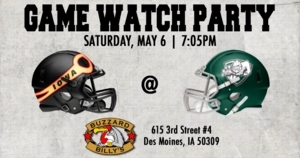 Cheer on the Iowa Barnstormers at Buzzard Billy's this Saturday, May 6 as the team travels to Green Bay to take on the Blizzard! Enjoy great food and drinks! Kickoff is set for 7:05pm.